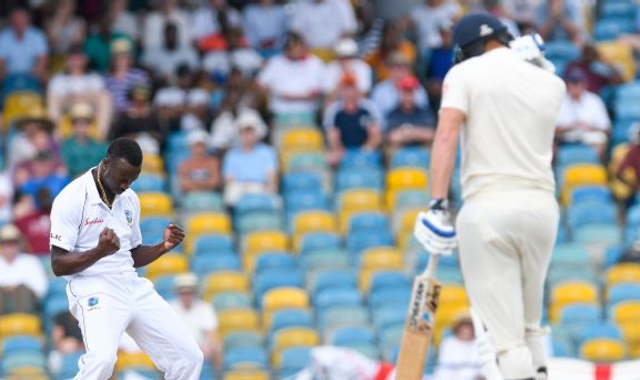 England were entitled to stride off the Kensington Oval after less than an hour’s play on day two with their chests thrust forward and grins on their faces, a job well done. They had, after all, restricted West Indies to a total of 289 on a pitch both captains wanted to bat on first. Three and a half hours later, the entrance to the field had become a dizzying turnstile for touring batsmen with shoulders hunched and jaws slack, trying to fathom what had just happened. What had just happened was an absolute demolition job as West Indies’ pace attack, led by Kemar Roach, bowled England out for 77, the lowest Test total to be posted in Bridgetown and 212 runs short of the home side’s modest first-innings score. Roach’s stunning spell of five wickets for four runs in 27 balls left England reeling at 48 for 6 and, with Jason Holder and Alzarri Joseph contributing two wickets apiece, the scene ended in carnage for the tourists, who had only four batsmen reach double figures with none of them making it to 20. On a day when 18 wickets fell, however, there was much more to come as England’s Ben Stokes and Moeen Ali combined to put West Indies under some pressure at 61-5. Shimron Hetmyer, West Indies’ top-scorer with 81 in the first innings, threatened to steady the second with Shane Dowrich, until Hetmyer fell for 31 late on a spectacular day of action. Dowrich remained unbeaten on 27 at the close along with Holder (7 not out) as the West Indies held a lead of 339. After James Anderson had claimed 5 for 46 to move level with Ian Botham’s record of 27 five-wicket hauls for England, and Stokes’ 4 for 59, England looked to be in a comfortable position at the end of the West Indies’ first innings. Then came Holder and Roach. West Indies captain Holder had Keaton Jennings caught cheaply, slicing a drive straight to gully to send England to lunch at 30-1. At the resumption, Roach cut loose. He flummoxed Rory Burns and Jonny Bairstow, forcing both to chop onto their stumps. At the other end, Joe Root was lbw for 4. Roach then claimed the wickets of Stokes and Moeen with consecutive balls. First to go was Stokes with an lbw that withstood England’s review. But when Roach caught Moeen on the hop with a blazing short ball next delivery that found a thick top edge, Joseph was there, on the boundary at fine leg, to pluck the catch from mid-air and add to the day’s spectacle in thrilling fashion. By the time Roach had Jos Buttler caught behind by Dowrich off a short, sharp delivery it seemed as though mere moments had punctuated the West Indies quick’s haul and, in the scheme of things, they had. Joseph combined with Dowrich to dismiss Ben Foakes for just 2, while Sam Curran was bounced out, caught by Shai Hope off the bowling of Shannon Gabriel, before Adil Rashid was last to fall. While the day belonged to Roach, Moeen and Stokes added intrigue where no more was needed. As in the first innings, West Indies’ batsmen have so far failed to build on starts, with openers Kraigg Brathwaite and John Campbell falling early and Darren Bravo making a forgettable return to Tests after two years by adding just 1 to his first-innings total of 2. At stumps Moeen had 3 for 41 off 12 overs and Stokes 2 for 31 off 11. A talking point before the match was West Indies’ decision to pick just one spinner and four quicks, while England opted for two slow bowlers and left out Stuart Broad. Given the success of the home side’s fast bowlers, selection must remain at the forefront of England’s analysis. Anderson added Joseph’s wicket to his four from day one and Stokes ended West Indies’ first innings with the wicket of Hetmyer but, by the time Hetmyer fell again, caught by Buttler off the bowling of Curran, who had edged Broad out of the team, all that seemed so long ago.